Fanvil X3P Sleek, Economic, Simple, Desk phone. 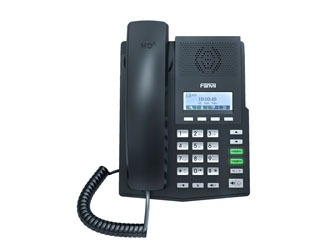 ● 2 Sip Accounts ● HD Voice w/ Full­Duplex Speakerphone ● User Friendly Menu w/ 128x48 dot­matrix with backlit Keypad ● 10/100Mbps Ethernet, dual bridged port for PC bypass ● PoE (802.3af) ● Power Supply not included with phone Fanvil’s new X3 IP Phone is an industrial masterpiece that offers superior user experience and simplicity for home and office users with an elegant appearance and intelligent software. X3 is positioning to be not only a telephone sitting on a user’s desktop for communication, but also a nice artwork in your living room or office.